The average annual cost for skin cancer treatment increased from $3.6 billion during 2002-2006, to $8.1 billion during 2007-2011, an increase in costs of 126 percent. The average annual cost for treatment of all other cancers increased by 25 percent during the same time period. Skin cancer, the most commonly diagnosed cancer in the United States, is a major and growing public health problem. The number of skin cancer cases has been increasing, but little was known prior to this study about the costs of treating skin cancer. Nearly 5 million people are treated for skin cancer every year in the United States. Most cases of melanoma, the deadliest kind of skin cancer, are caused by exposure to ultraviolet (UV) light. The Surgeon General’s Call to Action to Prevent Skin Cancer calls on all sectors to do more to reduce skin cancer. Examples include communities creating more opportunities for sun protection in outdoor settings, health providers counseling patients on the importance of using sunscreen, and colleges discouraging indoor tanning. 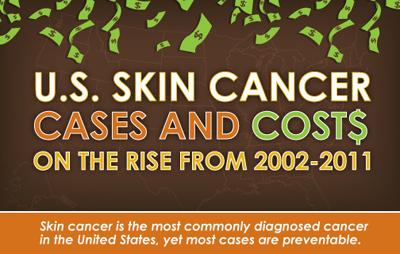 Visit www.cdc.gov/cancer/skin to learn more about skin cancer prevention efforts. Listen to a podcast on skin cancer prevention http://www2c.cdc.gov/podcasts/player.asp?f=8623906.